These 10 incredible bass waters may take some work to get to, but they are true hidden gems that few people fish. 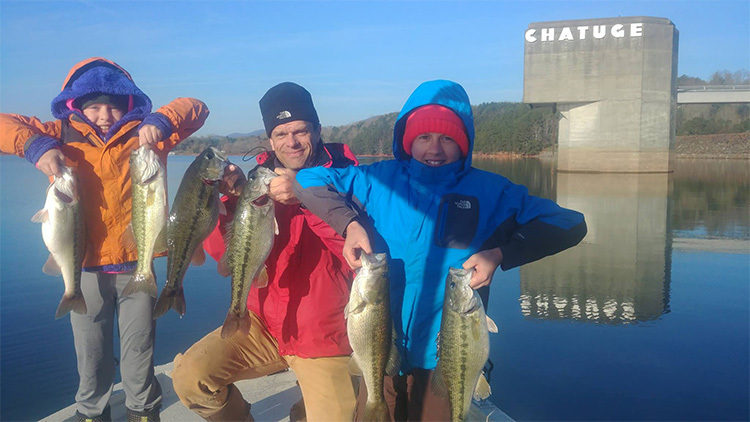 The names of some bass fisheries resonate with anglers on a national scale: Okeechobee, Kentucky Lake, Guntersville, Havasu, Clear Lake, Lake Fork, Falcon – and so on. They’re famous for producing big bass, lots of bass, or both. They deserve the accolades, but there are other, smaller fisheries around the country worthy of a bass fisherman’s attention, too. Typically, these waterways are hidden gems. Some of them are snubbed because they take some work and time to access, or they’re surrounded by so many well-known larger fisheries that they stay in the background. But they’re all bass fishing meccas that few people fish and deserving of your attention if you’re ever in the neighborhood. The St. Regis River and neighboring waterways are teeming with hungry smallmouth bass like these. 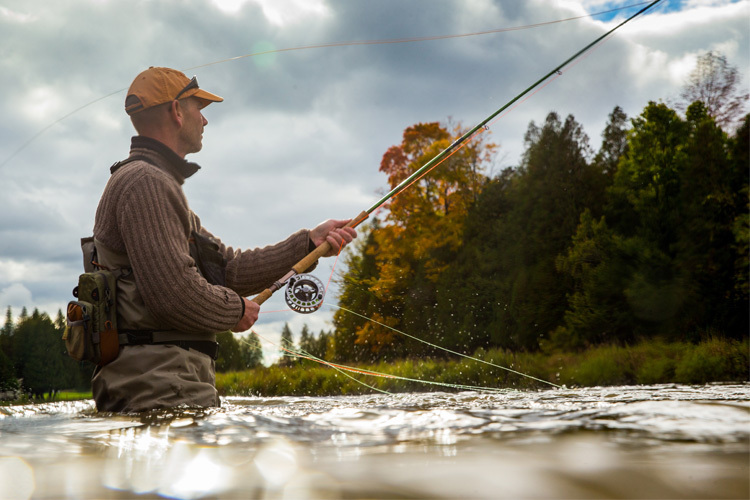 Some of the best fishing can be experienced where the St. Regis flows through Hogansburg, N.Y., in the heart of the St. Regis Mohawk Reservation. The St. Regis flows out of the Adirondacks into the St. Lawrence River and is a hidden gem among Northeast bass fisheries. In fact, it shares that distinction with two other nearby St. Lawrence feeders, the Raquette River and the Grasse River. Though the St. Regis can’t be described as remote, its best fishing lies within the boundaries of the St. Regis Mohawk Reservation – part of the larger Mohawk Nation at Akwesasne. Those who fish with a tribal member or tribal guide aren’t required to purchase the $40 annual permit; otherwise, the permit is available through the St. Regis Mohawk Council Conservation Program. Contact Conservation Officer Taylor Mitchell at 613-575-2250 Ext. 2412 for more information. Fishing season begins right after ice-out on the reservation, with smallmouths – and lots of them – available in the shoal waters of the St. Regis. Downstream, at the mouth of the river where it meets the St. Lawrence, largemouths predominate. Expect to catch a few northern pike and perhaps even a muskie while casting the standard bass baits. There are plenty of places to stay and eat in Hogansburg, which is the home of a popular casino. The best bet is to book a local fishing guide such as William Clute of Mohawk Trails (518-358-4373) before setting out on the St. Regis. 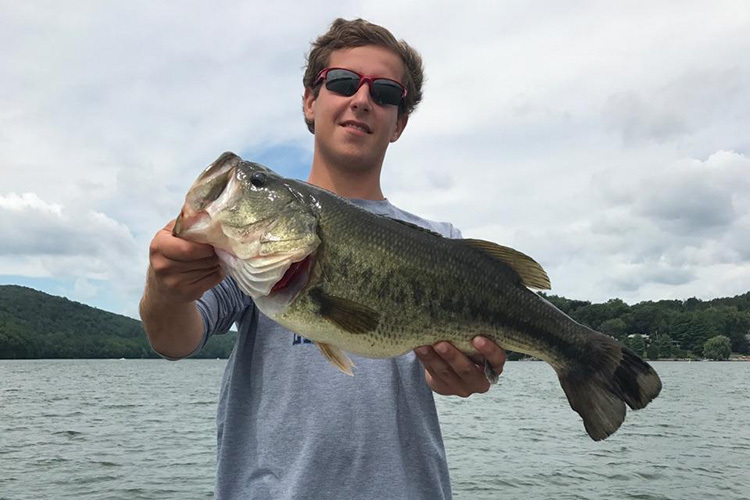 Lunker largemouths are part of the fishing program at Candlewood. Depending on when and where, exceptional bass fishing can be experienced in New England, though perhaps more so because fishing pressure there is relatively light as compared to other regions. Chalk Candlewood up as one of those underutilized fisheries, even if it is smack dab in one of the largest metropolitan areas in the country. The 5,400-acre impoundment is surrounded by Brookfield, Danbury, New Fairfield, New Milford and Sherman, Conn., and lots of marinas and guide services are available. 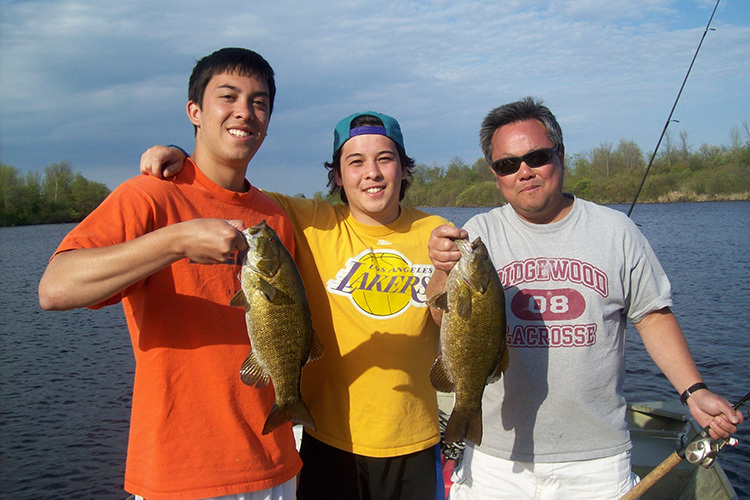 Smallmouths are the main course here, with fish topping 3 pounds on average being plentiful. There are also plenty of largemouths in the 3- and 4-pound class, but some over 8 pounds have been caught in recent years. Lake Erie, Mille Lacs, Lake St. Clair, Chequamegon Bay – there are so many great smallmouth waters in the Upper Midwest that Charlevoix often goes overlooked. Suffice it to say it is one of the best fisheries in the country for giant brownies and lots of them. This 17,260-acre lake is in the northeast corner of Lake Michigan between Mackinaw City and Traverse City and has the sort of habitat that produces smallmouths that are fat and aggressive. Charlevoix forks about midway into a South Arm and East Arm – the former more popular in late spring and early summer during the spawning season. The deeper water of the East Arm is a useful laboratory for fishermen who want to improve their drop-shotting techniques. The primary bass forage is crawfish and gobies, so crankbaits – lipped and lipless – produce a lot of fish early. Later, in the summer and fall, finesse baits shine. This is one of those lakes where you don’t have to worry about running out of fish. Charlevoix is connected to Lake Michigan by Round Lake at the town of Charlevoix, so it gets replenished on a regular basis. It’s also a good place to get out of the gales that sweep down from Canada in late summer. For more information, start with the Michigan Department of Natural Resources and Visit Charlevoix. After a lengthy drawdown, Lake Cumberland is back at its normal pool and home to some hungry bass. This mountain lake was a sick puppy in 2011. That’s when the TVA impoundment hit rock bottom at 43 feet below normal pool, so repairs could be made to its Wolf Creek Dam. Lake access became a problem and consequently kept a lot of bass from chomping down on lures. Now Cumberland has bounced back to its full 65,530-acre size and fishes like a new lake full of jumbo hungry bass. As far as numbers of big smallmouths are concerned, Lake Cumberland would give the more famous Dale Hollow to the south a run for its money. 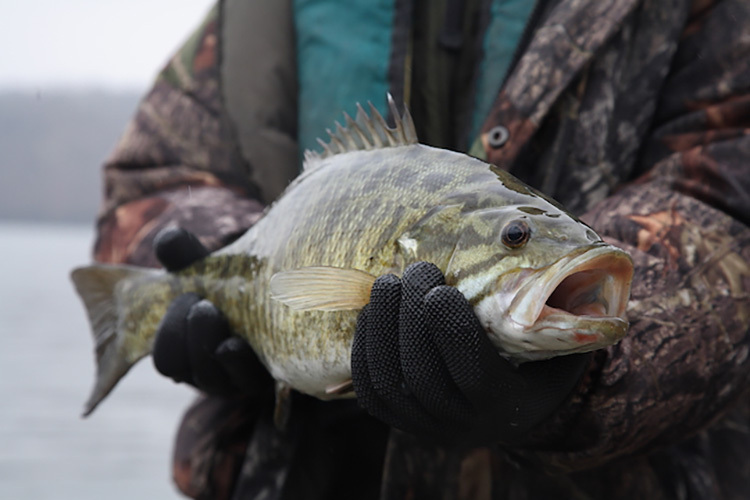 Though certain areas are known for their predominant populations of largemouths, smallmouths and spotted bass, the feeder creeks in the lower end of the lake harbors good populations of all three. For more information regarding local accommodations and a list of lake guides, visit Lake Cumberland’s tourism site. Spotted bass are the main attraction at Lake Chatuge, which North Carolina and Georgia share. Once you partake of the gorgeous sweeping views of the southern Appalachians in all directions, you might not care if the fish are biting are not. The scenery surrounding this 7,500-acre lake that sprawls from its dam near Hayesville, N.C. southward to Hiawassee, Ga., can be distracting, but actually the fishing has been coming on strong in the last few years. Mainly that’s due to the increase in the spotted bass population, though at the expense of the native smallmouths. Largemouth bass are available in good numbers, and spotted bass grown fat on blueback herring are the main course. There are still a few smallmouth bass in the lake, especially on the southern end, but spots have all but replaced them elsewhere. No fishing license? No problem. 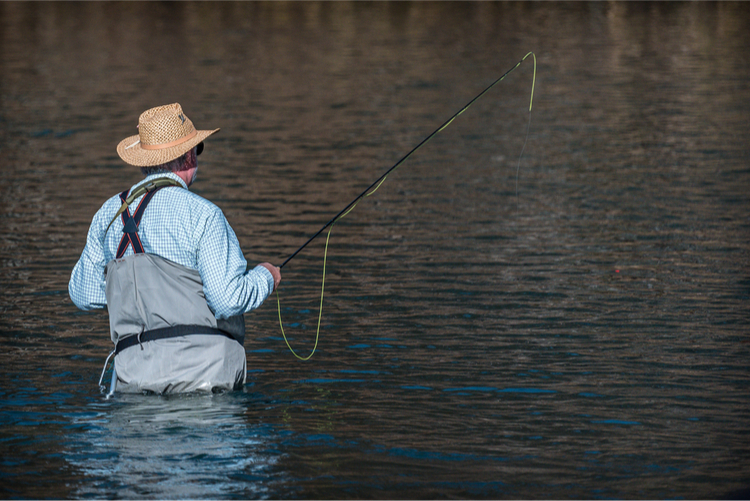 To encourage more beginners, most states (except Alaska) and the District of Columbia allow anglers to fish without possessing a license during National Fishing and Boating Week in June. This year the annual observance is June 2-10, with free fishing days typically occurring on the first or second Saturdays in June. However, some states offer two consecutive free days and other free days later in the year. 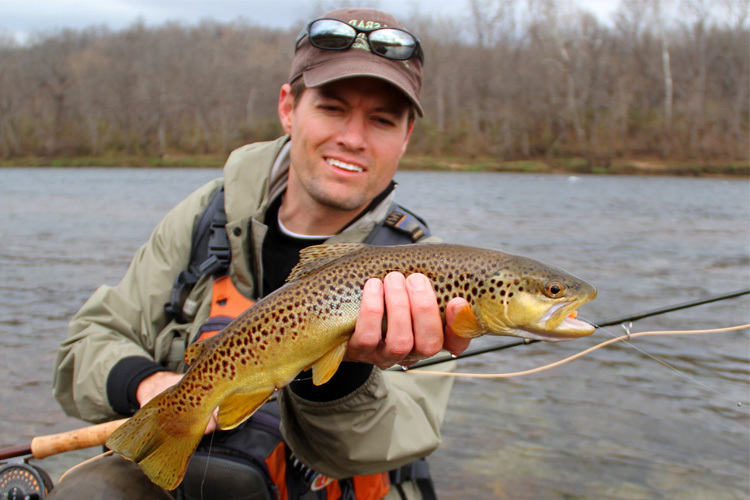 To see when you can fish without a license, visit your state’s game and fish agency website. Bass that exceed 10 pounds don’t raise many eyebrows in Ocala country. Typically, most newcomers to the national forest hire a local guide to learn where the best fishing holes are and what the bass are biting. 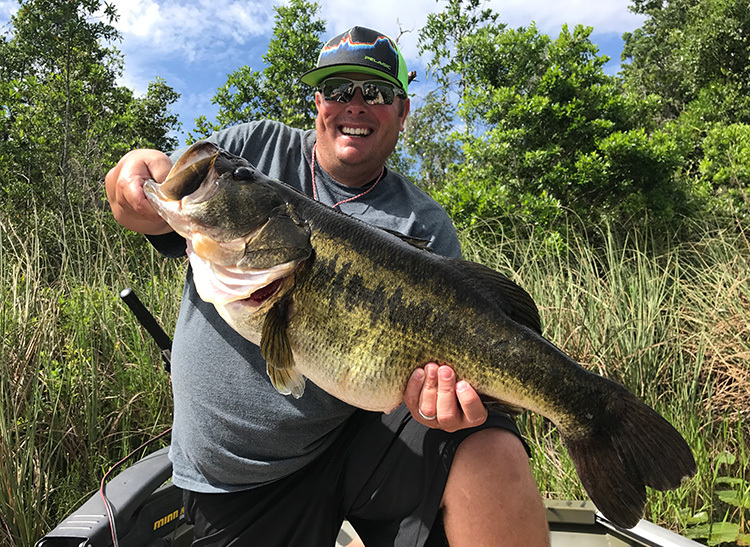 The late, nationally known bass fishing guru, Doug Hannon, rated the lakes and ponds within Central Florida’s Ocala National Forest as his favorite destination for humongous Florida bass. He also considered it the likely home of a new world record that will beat the current mark of 22 pounds, 4 ounces. The ponds and lakes range in size from a few acres to several hundred acres. Of the 40 or so lakes that are fishable here in the southernmost national forest in the country, about half have boat ramps, though some of these are suitable only for kayaks or small johnboats transported in with 4-wheel-drive vehicles. The effort is usually worth it, however, especially if you’re the type of angler who likes peace and quiet while you’re fishing. Typically, the lakes and ponds are shallow, tannin-stained and support a variety of aquatic vegetation. Take along plenty of weedless soft-plastic baits such as frogs and worms, and be advised: This is no place for light lines and light tackle. The Forest is flanked by Daytona Beach on the east, Ocala on the west and Gainesville to the northwest, so finding all the comforts an urban area provides isn’t difficult. Also, there are a number of campgrounds in the Forest that take reservations (877-444-6777) and fees range from $4 to $20, depending on services and locale. A few cabins are also available for rent or you can rough it, as primitive camping is allowed in designated areas except in gun hunting season. Everything’s bigger in Texas, though 18,700-acre Lake O’ the Pines is not huge compared to such giants as Sam Rayburn and Toledo Bend. Similar to a north Florida lake, Lake O’ the Pines has an average depth of about 13 feet, with stained waters and a reputation for quality fishing in early season. Though Lake Fork is the undisputed leader when it comes to producing big Texas largemouths, Lake O’ the Pines isn’t too shabby either, as the lake record is just over 15 pounds. It was caught in late March 2010 on a Rat-L-Trap. If you want big lakes and the company of lots of other bass fishermen, target famous Arizona fishing holes such as Apache Lake, Navajo Lake or Havasu. If you want to enjoy a getaway far from the madding crowd, though, Black River is the place. The West and East Forks of the river start in the alpine setting of the White Mountains of northern Arizona and downriver from where they meet offers some of the best smallmouth fishing in high desert country. The lower part of the Black produces numbers of 2- to 3-pound smallmouths and the occasional larger fish. Spinning tackle rigged with inline spinners, small jerkbaits, jigs and the usual mix of smallmouth baits work well, though fly-fishing gear and crawfish patterns, Dahlberg Divers or Wooly Buggers arguably see more fishing time here. Plan to fish out of canoes or kayaks but be forewarned: the upper Black River has a few stretches of rapids and shoals and isn’t a waterway for beginning paddlers. The terrain gradually flattens farther downstream and the Black broadens to take on more of the characteristics of a lowland river. As the Black River is the boundary between the San Carlos Apache Reservation and the White Mountain Apache Tribe Reservation, fishing access permits are required, depending on which side you fish or put in on. On the San Carlos side, a daily permit costs $10 while on the White Mountain side, it’s $9. Annual permits are available too, as are camping permits. There are a number of other fishing permits available that cover other lakes and rivers on the reservations. Access points are numerous, but usually involve unpaved roads. Still, it’s the remoteness that makes the Black River a fishing destination in a league of its own. Who goes to Big Sky Country to fish for bass? Hardly anyone, but maybe they should. The waters of this 7,700-acre impoundment on the Clark Fork River near Trout Creek in the northwestern corner of Montana are teeming with largemouth and smallmouth bass. Noxon Reservoir hosts a few tournaments in the summer months, but except for the random weekend angler from Kalispell or Missoula, it practically goes unnoticed. The fishing here is first-rate, however, as are the knockout views of surrounding mountains. It might seem odd to pick an entire region over just one lake, but there are so many good, underutilized fisheries in northern California that the entire region deserves mention. For instance, 30,000-acre Lake Shasta is a great spotted bass fishery and Whiskeytown Lake (3,458 acres), near Redding, produces lots of trophy spots as well as largemouths and smallmouths. For a number of years, Trinity Lake, northwest of Redding, was known for producing the state-record smallmouth bass of 9 pounds, 1 ounce. 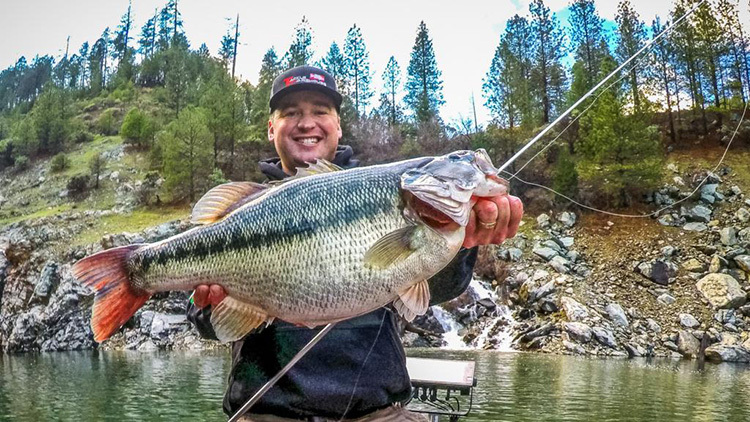 In 2017, 4,700-acre New Bullards Bar Reservoir in North Central California, near Yuba City, yielded the world record spotted bass of 11 pounds, 4 ounces – and plenty more in the same weight class. A Google search will provide the names and website addresses of plenty of guides at any of the lakes.